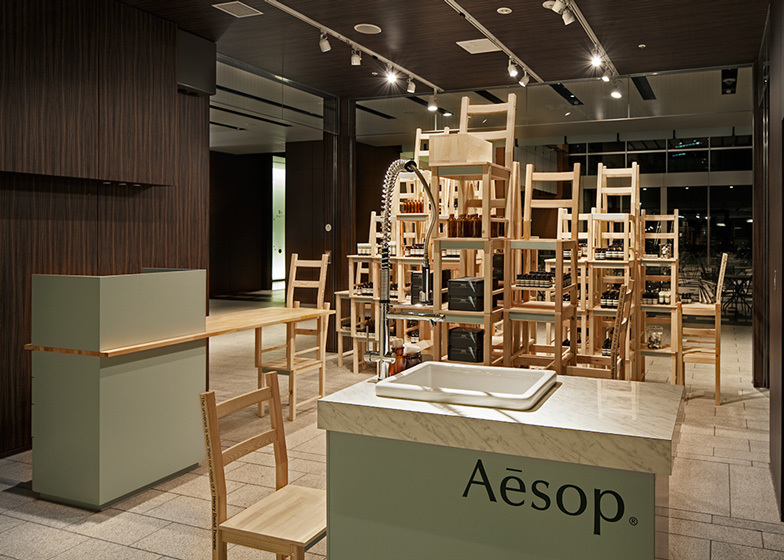 Wooden chairs were piled on top of one another to create the shelves of this pop-up shop for skincare brand Aesop in a Tokyo shopping centre. 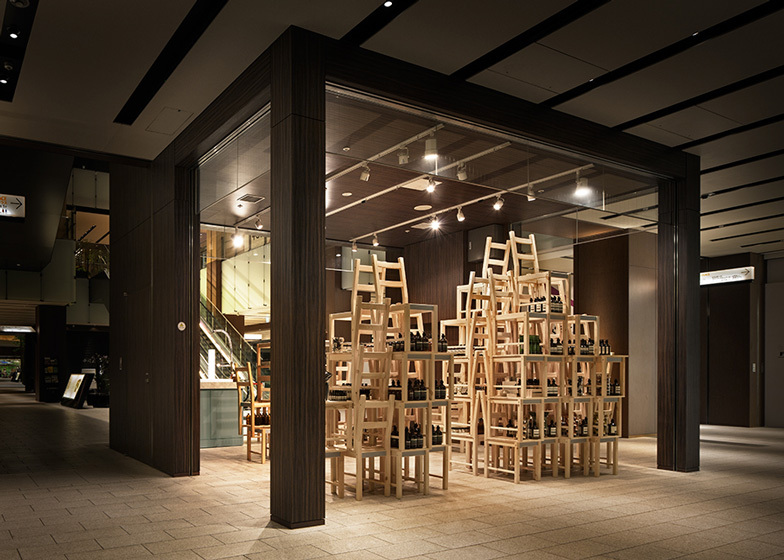 Designed by Aesop creative manager Hiroko Shiratori, the Aesop Midtown Installation created a temporary store for the brand earlier this summer in front of a pair of elevators in the Tokyo Midtown Galleria. Half of the chairs were turned upside down to create the stacks, which formed the display areas for rows of Aesop's signature brown bottles. Quotes from various philosophers were inscribed onto the sides of a few selected chairs, plus some were still used as places to sit. The space was completed by the addition of a wooden counter and a fully functioning sink. 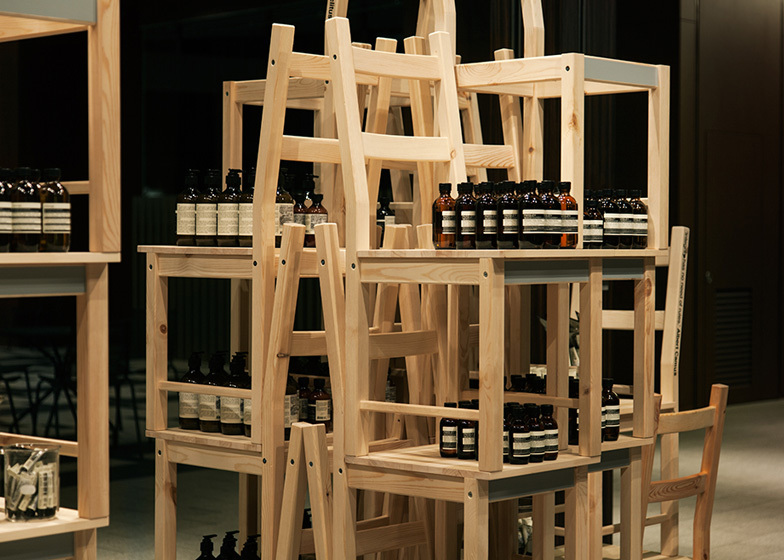 Dezeen interviewed Aesop founder Dennis Paphitis in 2012 about his brand, which regularly commissions designers to come up with unique concepts for stores. He explained: "I was horrified at the thought of a soulless chain". 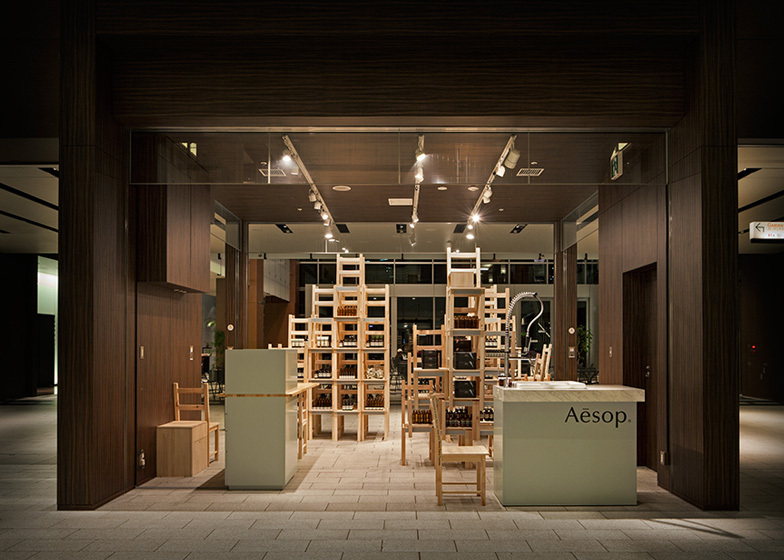 Aesop enjoyed a temporary residence in Tokyo Midtown Galleria from 24 April until late June, 2013. Designed by Aesop Creative Manager Hiroko Shiratori, the interior employed utilitarian chairs in clever linear assembly to create makeshift walls, borders and shelves. This transitory Midtown installation complemented the brand's permanent signature stores in Aoyama, Ginza, Shin-Marunouchi, Yokohama and Shibuya. It offered a complete range of skin, hair and body care, and was fitted with a demonstration sink to facilitate the immersive sensorial experience for which Aesop is renowned. Hiroko studied at the Royal College of Art and Chelsea College and Tokyo Zokei University. She has exhibited in London, Milan, Cologne and Tokyo and her work has been featured in Wallpaper, Casa Brutus, Domus Web, Axis and similar publications and sites. Aesop was founded in Melbourne in 1987 and today offers its superlative skin, hair and body care products in more than sixty signature stores internationally. As the company evolves – new stores open soon in Hong Kong, London, and New York – meticulously considered and sophisticated design remain paramount to the creation of each space.